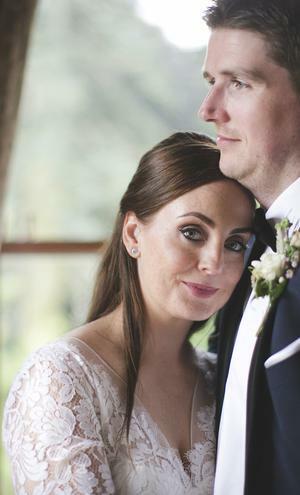 Two months after the arrival for their first child - their daughter Marni - Aidan popped the question during a peaceful night away at The Cliff House Hotel in Waterford. 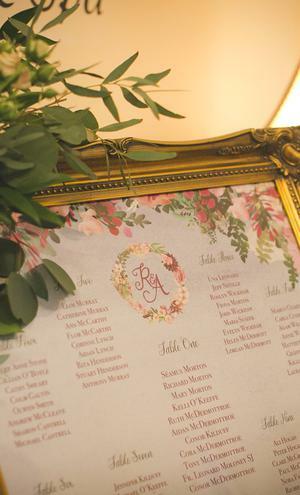 As an event planner, Ruth found planning the big day pretty straight forward. 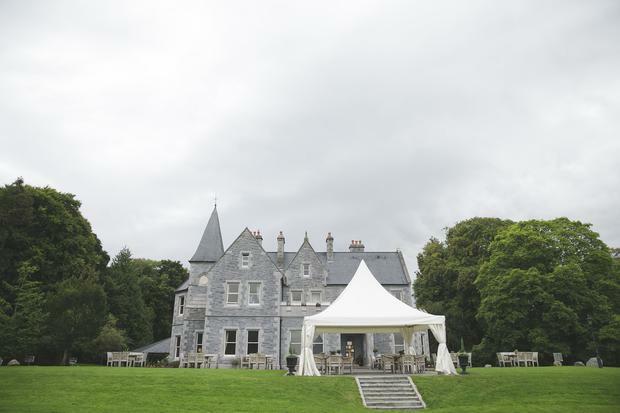 The couple came across Mayo wedding venue Mount Falcon Estate online and immediately loved the look of it. "We did look at other venues but felt like we were cheating on Mount Falcon so we knew it was the right place for us," Ruth jokes. 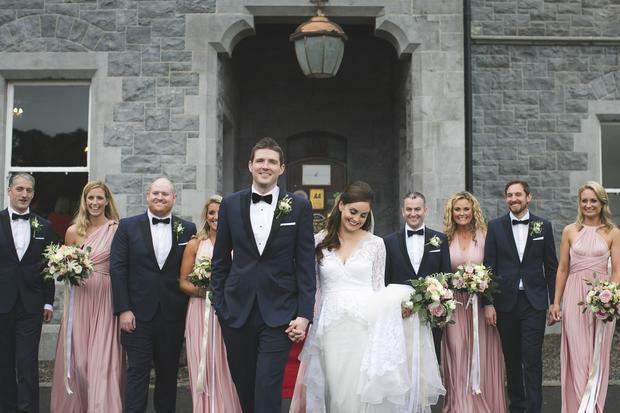 They tied the knot 2nd September 2017 at St. Michael's Church, Foxford, Co. Mayo where the Dublin Gospel Choir sang a medley of their favourite songs. For the drinks reception the couple set up a 'Pimp your Prosecco' station, where guests were invited to add delicious extras to their bubbles. For a little extra entertainment they had arranged for a falcon display for guests during the drinks reception, however the Irish weather being what it so often is, they were forced to take things indoors. 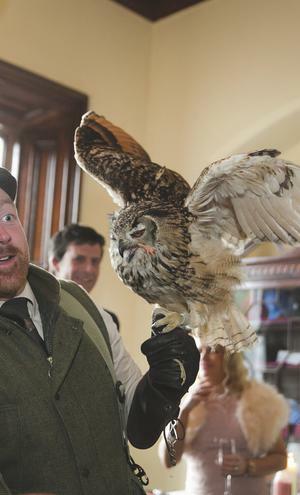 "It was a pretty amazing apart from when one bird flew into a closed window and another pooped on a guest’s dress," Ruth laughs, "- sorry Megan!" 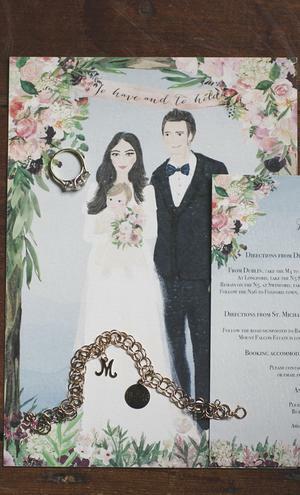 Their photos are by Tara Aherne. 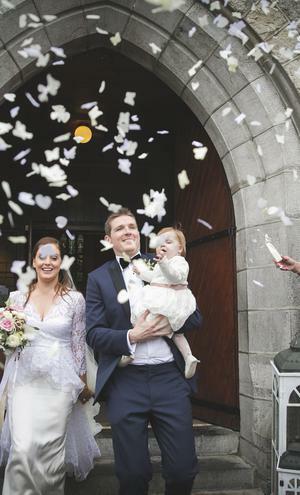 Ruth found her Temperley wedding dress in Little White Dress Bridal Boutique in Castleknock Village (now trading only as a consultant agency for bridal boutiques). 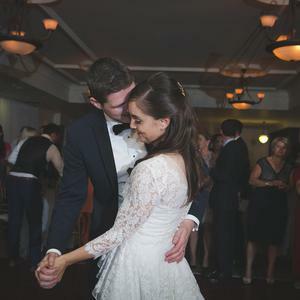 "Janet in Little White dress made the experience so personable and enjoyable. 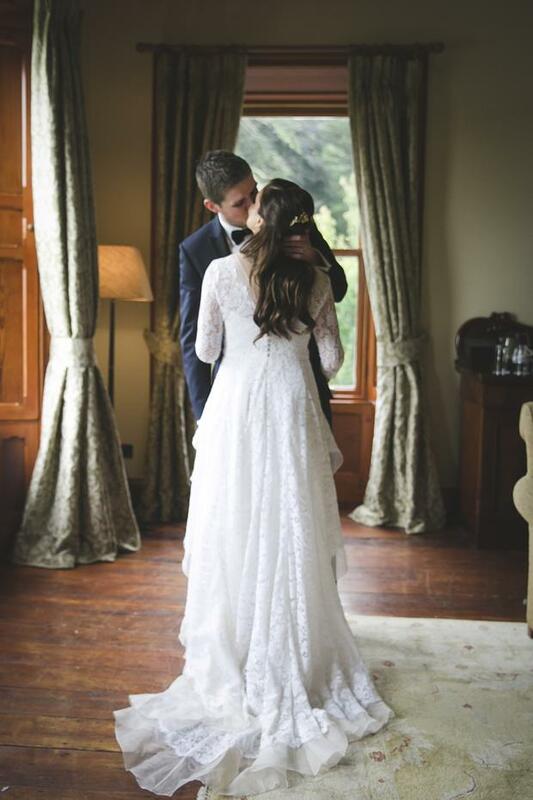 When I tried on the ‘Posey’ Lace Temperley dress I knew I had found the one!" For her 'something blue' she wore blue Swarovski earnings, and accessorised with a a gold bracelet that her mother had given daughter Marni for her christening. 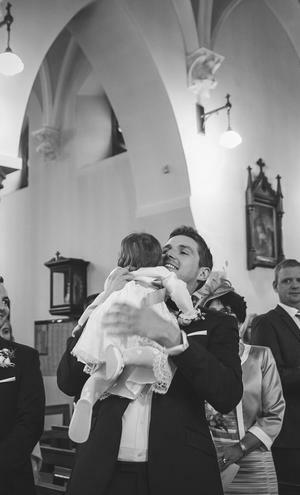 Her wedding shoes were from River Island: "I bought them a few years earlier as they looked just like the Jimmy Choos and they were a great price!" 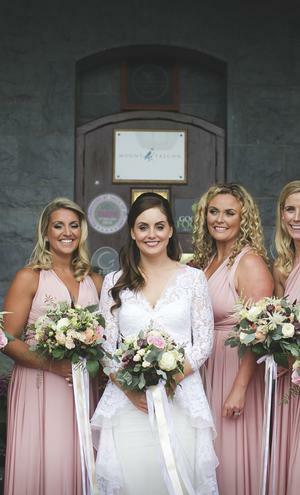 Ruth's beautiful brunette locks were styled by Martha from Allure Hairdressing, and her make-up - a flirty feline flick and pretty berry lips - was done by Michelle Kinsella. 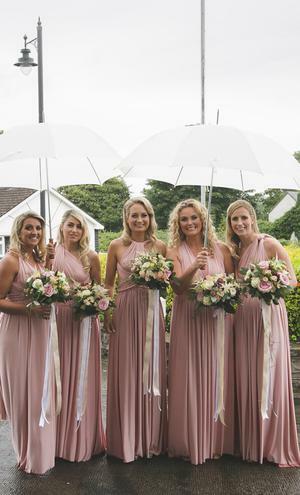 The bridesmaids wore multiway dresses in pretty pink, which came from Ruth's dear friend Ali Murray's shop, Alila - "I wanted all of my bridesmaids to be comfortable, so the multiway dresses were perfect." The couple first came across Mount Falcon Estate online, and fell in love with it when they went to visit. They planned a relaxed, fun day for friends and family, with Ruth enjoying planning with Alan, the on-site co-ordinator. 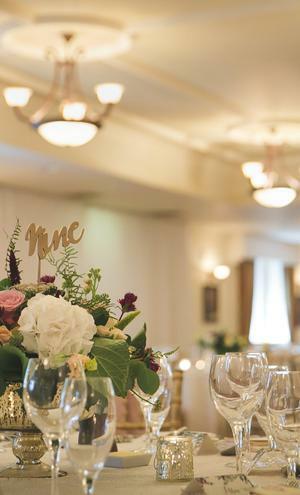 "We wanted to make sure the décor fitted in with the function room and house itself so there was lots of lace, flowers, candles and gold accents." 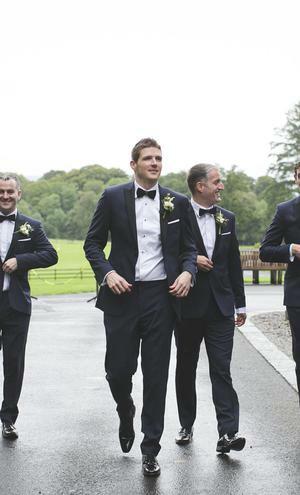 Aidan and his groomsmen got their wedding suits from The Formal Suite on Duke Street, Dublin. "It was quite a quick process," says Ruth. "Aidan knew he wanted dark navy tuxedos and we had a look around town one afternoon and the last stop was The Formal Suite. As soon as we saw the quality of their suits the search was over. The were so helpful and it was a very relaxed shopping experience." 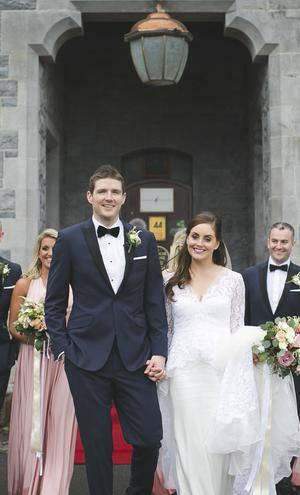 Ruth and Aidan exchanged vows in St. Michaels Church, Foxford, Co. Mayo. Their ceremony was presided over by Very Rev. Fr. Leonard Moloney, S.J., Provincial. "My friend Ali is a member of the Dublin Gospel Choir," says Ruth, "so she joined the singers for a medley of my favorite songs. My uncle Anthony also sang The Prayer with the choir. Both were very special moments." "The music in the church," Ruth says was her most memorable moment, "especially when loved ones sang." Of course the falcon display at the venue probably came a close second! "We were worried they wouldn't go ahead with the falcon display due to the weather, but Mount Falcon were more than happy to have it indoors. It was a pretty amazing apart from when one bird flew into a closed window and anther pooped on a guest’s dress - sorry Megan!" Overall however for both Aidan and Ruth the one thing that made the day was being able to share it all with their one-year-old daughter. Growing most on their own produce on the estate itself, the wedding menu was seasonal to Mount Falcon. For their drinks reception they had a ‘Pimp your Prosecco’ station where guests could add raspberries, strawberries, mango coulis or Limoncello to their bubbles. 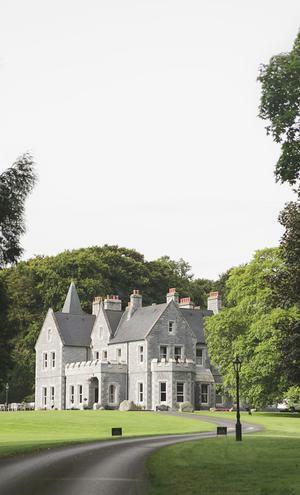 The couple enjoyed three days to themselves in The Europe Hotel, Killarney before heading to Martinhall in Sagres, Portugal with daughter Marni. "Still not sure we are calling that one a ‘Honeymoon’!" Ruth jokes, "we might have to look at South Africa in a few years’ time!" The one thing they'd like to change if they could? No surprises - the weather! "It rained all day," says Ruth, before concluding: "but it didn’t matter in the end as there was nothing else we would have changed." "Enjoy it! It can get overwhelming at times, but wit will all come together on the day."